Richard Wellings, with his phd in transport and environment' believes presumed liability is a justice thing, it's not. 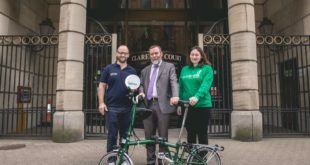 Dr Richard Wellings, the deputy editorial director of libertarian think-tank Institute of Economic Affairs, has with a Transport and Environmental Policy PhD, tweeted that the cycle lobby "should be ashamed of itself" for campaigning for presumed liability. Wellings has seemingly failed to understand that presumed liabilty is an insurance issue, not a innocent-until-proven-guilty justice one. Wellings isn’t a fan of cycling infrastructure either, criticising admittedly often ignored Advanced Stop Lines in favour of ”more efficient use” of road space. In a blog posting, Wellings criticised the economic costs of London’s gradually increasing cycle share, all while ignoring the DfT study on the up to 35:1 BCR of two wheeled travel. Presumed liability would benefit pedestrians as well as cyclists, as well as cars in the event of a collision with a HGV. Wellings has in the past courted controversy, even falling into the mythical ”road tax” trap, as co-author of the anonymously funded free market roads report in which he encouraged the privitisation of roads. In that report he said: "Denationalising the network would ensure British motorists had better roads to drive on. "much of [£10bn spent on roads is spent] on anti-car traffic calming schemes, priority measures for buses and cyclists and so on." "Removing underused cycle and bus priority measures will increase efficiency of the network…Uneconomic cycling priority measures…impose major time losses on motorists. Another problem is that cyclists fill up gaps in traffic due to slower speed, delaying motorists at junctions.